Why do I blog? This is a question I've asked myself a million times over. Why write? Why document? No matter how many days go by, I always find myself wanting to come back to this space to share, but why? A sweet friend of mine shared a blog post with me from Ker-Fox Photography (see link above) that totally answered this question for me. It's hard to put yourself out there as a "blogger". It sort of automatically asks for an eye roll from other people. It's also sooooo hard to balance Instagram + blogging and not infiltrating Instagram with blogging content - you know, keeping it real and not just as a blog plug. There is nothing more that I want to share than our life - our real, unadulterated life that is messy and hard at times, but absolutely good and happy. As parents, my husband and I work hard to create joyous memories for our kiddos. Oh how we love those two humans! I want my children to look back and know that we worked hard, that we noticed them, that we loved them. Sadee will occasionally grab one of our printed blog books and look through the pictures. She'll ask questions about different pictures and we'll talk about different times in our life - college, fashion, when I was pregnant with her or Cam. I find that the older I get the less I remember - which is totally normal... right? Looking back helps me remember and the things that I haven't written down are almost erased from my memory. It's terrifying at times how little my brain actually holds on to. But what has been written, I remember. And finally, I want to share the ways we create happiness in our family. True happiness comes when we intentionally seek it, discover it and create it. All of our families are different, but as I read how others are creating their happiness on Instagram or through blogging it helps me, lifts me and fills me with hope. I share for those younger than me to know that you're never alone. Someone has always taken your path before, someone will always understand. We've been there. I share for those older than me to know that they have taught us well. We're passing on your legacy of strength and endurance. We're making your famous recipes and sharing them with those closest to us. I share for those who are exactly in the same spot as me. We share lego covered floors, skinned up knees and cars filled with car seats. We're in this together. That is why I blog - for my children, for myself and for anyone needing a friend, for YOU! 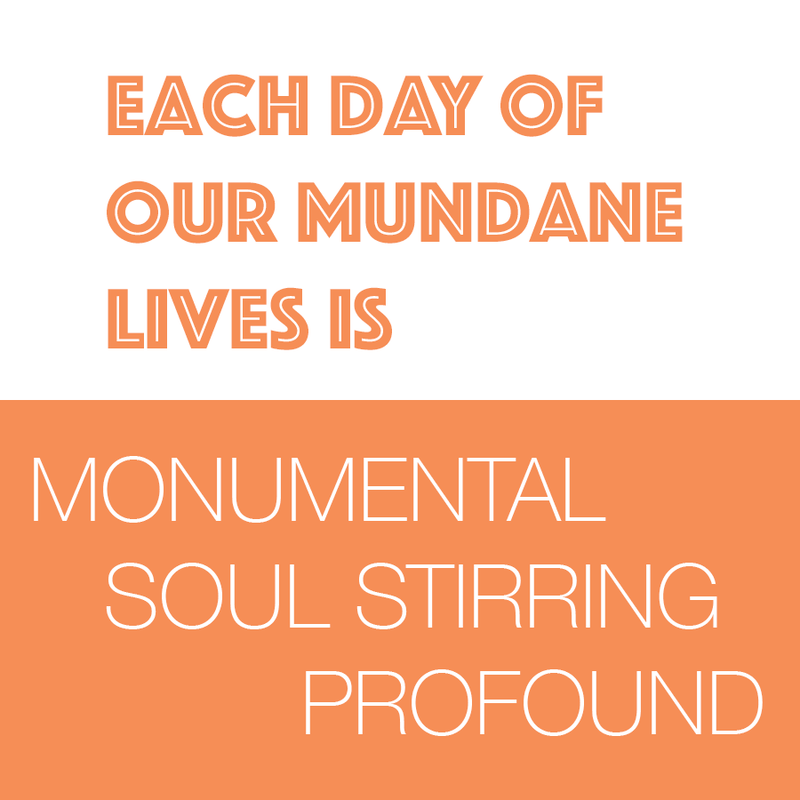 Because truly "each day of our mundane lives is monumental, soul stirring, profound."